As academics, my cofounder Thomas and I are no strangers to the scientific method. We have been testing hypotheses since we first explored science and programming in elementary school, but applying the scientific method to business development is a new (and logical) innovation to us. Therefore, we were excited to participate in the NYU Summer Launchpad accelerator to apply hypothesis-testing to business development. As with many founder teams, our own pain points inspired our venture, geopipe. We each were exploring side projects that involved video games and the real world: Thomas was trying to turn the real world into virtual LEGO blocks for a multiplayer game, while I wanted to convert New York City into an expansive, immersive Minecraft world. As each project matured, we independently hit the same snag: the virtual models of buildings and structures in the real world we wanted simply weren’t available. From our pains, we found the spare time between our studies to develop our technology. 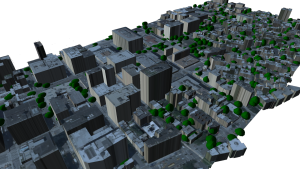 Soon, we could automatically turn data about the real world into rudimentary virtual models – without wasting hours we couldn’t spare, manually creating these virtual models. As we worked on our technology, we realized that there are other people with the same problems. These people are painstakingly modeling the real world for their own applications, and if they could save that time and effort, their jobs would be better, more productive, and most importantly, more profitable. However, we started geopipe with only a hypothesis of who these users might be, from video game designers and special effects artists to civil engineers and architects. We were eager to learn how to validate the hypothesis through the Summer Launchpad’s implementation of Steve Blank’s Lean Launchpad methodology. We anticipated narrowing our search down to an initial customer, finding out what their pressing pain points were, and putting those pains into quantitative terms. Along the way, we were eager to develop our own skills as founders and entrepreneurs. Along with our hypothesis on our customers, we discovered that we had developed a host of other hypotheses without realizing it. Through the accelerator, we were able to put into concrete terms our initial guesses about our precise value proposition for each potential customer, our costs and revenue, and our partners and channels. We learned how we would spend the ten weeks of the Summer Launchpad validating (and invalidating) these hypotheses the way all hypotheses in science are challenged: through repeated, rigorous testing. Our customer discovery process started from the first week of the program, getting out of the building to meet with as many individuals in our potential customer ecosystems as we could reach. We spoke to businesswomen and men, engineers, students, professionals, and managers, and from there, spread our net from conversations with one-person firms to companies with tens of thousands of employees. Our interview count ticked ever higher, the signal in our results rose further above the noise floor, developing our prowess as entrepreneurs. Under the direction of the Summer Launchpad teaching team and our tireless investor and entrepreneur mentors, we grew bolder and more diplomatic at asking for what was needed to hone our hypotheses. We discovered that our results showed we were wrong about our most promising initial customer, and started focusing our chats on a new set of professionals. Although we have narrowed our search down to a specific initial geopipe customer, our academic experience has taught us that even mature hypotheses must be continually challenged and re-proven. As the Summer Launchpad ends after ten short weeks and our business (and our technology) continues to develop, we expect to find that at least some of our hypotheses will have to be further refined or even invalidated. Discovering competing and adjacent ventures has driven us between despair and encouragement, but has been a vital part of the experience. In the end, every facet of our customer discovery is a data point that must lead us to a supportable conclusion reached through a correct application of the scientific method. Thomas and I started the summer thinking that our biggest challenge would be a technical one, refining our clever algorithms to turn big data about the real world into expansive virtual worlds. We ended having worked even harder to perform the equally rigorous task of refining our business model. We learned to estimate the size of our initial market, and we considered how we could tailor our MVP to best solve the pains we discovered in that market. We’re excited to continue to test our hypotheses and grow as entrepreneurs, as scientists, and as the founders of geopipe through the next few weeks at the Leslie eLab and beyond. About the author: Christopher Mitchell, Ph.D. is a native New Yorker and a postdoctoral researcher in the Networking and Wide-Area Systems Group in the Courant Institute of Mathematical Sciences at NYU. His Ph.D. research centered on high-performance distributed in-memory storage. He previously received his Bachelors and Masters of Engineering in Electrical Engineering from Cooper Union. He met geopipe Inc. co-founder Thomas Dickerson (a fourth-year Ph.D. candidate at Brown University) twelve years ago through an online community dedicated to their shared love for programming TI graphing calculators. 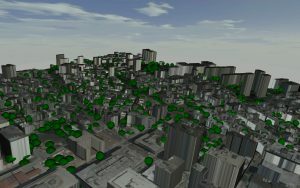 geopipe leverages cloud computing to turn big data into expansive virtual models of the real world. Christopher previously founded Cemetech, the aforementioned group of volunteers teaching high school students programming, and providing a space to develop and show off DIY software and hardware projects. He is the author of two books on math and programming, and a lifelong train buff.